When you visit Patrick’s Point State Park, don’t forget a visit to the reconstructed Yurok village - "Sumêg" - consisting of traditional style family houses, a sweat house, changing houses, a redwood canoe, and a dance house. The village is used by the local Yuroks for education of their youth and to share their culture with the public. Sumeg village was built by Yurok people using modern tools but with traditional materials in the traditional style of a permanent village. 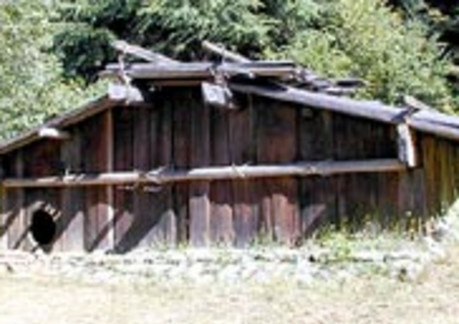 The primary building material is split redwood planks, which are what the Yurok people have used for centuries. "Sumeg" is the place name of a former Yurok seasonal fishing camp, not a permanent village. Sumeg was located in the place now occupied by Patrick’s Point State Park, but down by the ocean. The nearest permanent village was Tsurai (roughly pronounced Cher ray or Cher eye) near the present town of Trinidad. Sumeg Village is one place of connections linking the past to the present and future. The modern Yurok live in modern houses in a modern world. Still, many Yurok enjoy the brush dances and other cultural traditions of their heritage. Sumeg village is one of the places where these traditions are still enjoyed. 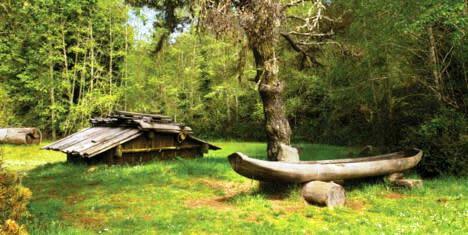 The two redwood dug-out canoes were built by Yurok people using modern tools, but in traditional style. Before they had modern tools, dug-out canoes were built with equal skill, but much more laboriously using sharpened stone tools and fire. Consequently, each canoe had great value and could be used only by persons who could be trusted to exercise ability, care, and judgment. 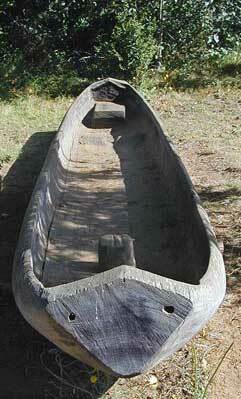 The Yurok built canoes of several sizes. 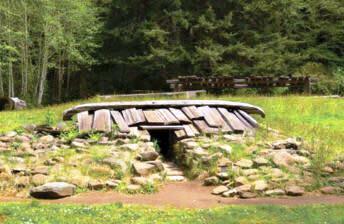 The ones at Sumeg village are small, approximately the size that would have been used on the Klamath river. The Yurok also built some much larger, ocean-going canoes. There is a replica of a larger canoe at the Redwood Information Center in Orick, 15 miles north of Patrick's Point State Park. Adjacent to Sumeg Village is a native plant garden where you will find native plants that were used for baskets, food and medicine. In 1973, Patrick's Point Garden Club established what has become a native plant repository, comprised of as many plants as possible that grow in the unique environment of our coastal fog belt and the humid transition zone between the ocean and mountain slopes. In 1997 this garden was reestablished as a Native American plant garden which now has plants that were used by the local Yuroks. The plantings in the reestablished garden are representative of the plants used for medicinal, basketry, substance, and ceremonial purposes. The Native American Plant Garden is located just east of and adjacent to the Yurok Indian Village.